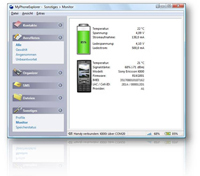 MyPhoneExplorer is a proprietary freeware desktop application allowing management of Sony Ericsson and Android mobile phones. It is developed in Austria but has been translated into many languages, including English. MyPhoneExplorer can connect to a Sony Ericsson phone using USB cable, Bluetooth or Infra-red connections. Once connected, address book entries can be synchronized between the phone and MyPhoneExplorer, Microsoft Outlook, Microsoft Outlook Express, Mozilla Thunderbird or Google Mail. Calendar entries can also be synchronized with many systems, including Google Calendar. As with the PC Suite software which is normally shipped with Sony Ericsson mobiles, files can be dragged and dropped to and from the phone's memory and memory stick. Notably, however, MyPhoneExplorer also allows calls to be managed (i.e. dialled and answered) from within the application, and allows SMS text messages to be saved, read, written, sent, etc. directly from a PC. Moreover, it provides feature of back-up and restore which can back up everything like messages, contacts, calender entries, and files. MyPhoneExplorer was initially designed for use with Sony Ericsson K700, K750, K800 mobiles, but FJ Software state that it works with all Sony Ericsson phones which are not Symbian-based. Later versions of the software has support for some Symbian based Sony Erricson phone although some older models are unsupported or require workarounds. Since version 1.7, MyPhoneExplorer has supported all Android phones running Android 1.6 or higher.